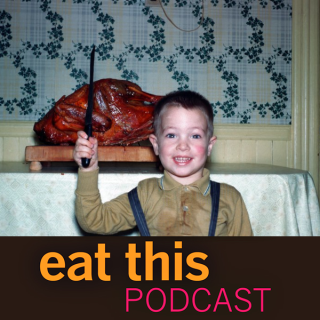 As Thanksgiving ebbs into memory and Christmas looms on the horizon, Eat This Podcast concerns itself with the turkey. For a nomenclature nerd, the turkey is a wonderful bird. Why would a bird from America be named after a country on the edge of Asia? The Latin name offers a clue; the American turkey is Meleagris gallopavo, while the African guineafowl is Numida meleagris. But why did the first settlers adopt a name they were already familiar with, rather than adopt a local indigenous name such as nalaaohki pileewa for the native fowl. Simple answer: nobody knows. Then there’s the question of how a somewhat shy bird of the underbrush turned into the monstrous spectacle that graces holiday tables? And why is Rockingham County, Virginia, the turkey capital of the world? That last question is actually rather easy to answer, as I learned from Nancy Sorrells, a local historian in Rockingham County. The domestication question, however, is far from simple. Greg Laden, a biological anthropologist and science writer, did his best to explain it all. And at the end of the day, I confess, I prefer goose. Of course Wikipedia has a List of names for turkeys. Greg Laden writes at Science Blogs, and elsewhere. You surely don’t need to be told that the Turkey Trot was performed by Little Eva. Samuel H. Blosser, pioneer of artificial incubation, lived to be very nearly 90. Banner photograph modified from an image by Don DeBold. Nicola Davies liked this note on twitter.com. Nicola Davies reposted this note on twitter.com. First Last liked this note on twitter.com. For a nomenclature nerd, the turkey is wonderful. Why would a bird from America be named after a country on the edge of Asia?